The young man in my office “knew” that the substantial equity in his home was exempt as a homestead, even if he filed bankruptcy. He “knew” that credit card debt was dischargeable. And that “knowledge” lead to his conviction that , in bankruptcy, he could keep the house and ditch the credit card debt without payment. In his mind, bits of legal truth got stitched together into a bankruptcy myth. Let’s unravel the truth. But: the homestead is limited to a certain amount of value. For the single guy sitting across my desk, that amount was $75,000. Equity in his condo in excess of that isn’t protected by the homestead. True: unsecured credit card debt (not incurred by fraud) can be wiped out in bankruptcy. But: the discharge speaks to whether the debt survives the bankruptcy and is enforceable afterwards. Being dischargeable doesn’t mean that creditors don’t share in the bankruptcy distribution. True: every debtor can claim exemptions that protect the exempt amount from being paid out to creditors in the bankruptcy case. But: the asset value not protected by an exemption is available to pay the claims of creditors, as far as that value goes. For most unsecured creditors, all they get from the debtor is their pro rata share of the non exempt property of the estate. Any unpaid balance is discharged. So when the bits of the law my client got right are expanded and seen as a whole, any bankruptcy discharge was unlikely to result in paying less to his creditors, because his house represented far more value than the debts, dischargeable and non dischargeable, that he owed. Likely, in either Chapter 7 or Chapter 13, his creditors would get 100% of their claims. In my view, any amount he might save in reducing the interest accruing on those claims to the bankruptcy interest rate would be eaten up by the legal fees to file the case, and the credit hit he would incur. The one critical bankruptcy advantage might be the power of the automatic stay: if the mortgage lender threatened a foreclosure before he could cure the secured arrears, bankruptcy could stop foreclosure long enough to either propose a Chapter 13 plan, or arrange family help to keep the house. * In Chapter 13, the homeowner could strip a tax lien down to the value of the home after all senior liens were subtracted. The stripped down lien would have to be paid in full through the plan. The balance of the tax lien would be treated as an unsecured claim. Lists of stupid laws are lots of fun, when they don’t really touch your life. But the law that gags mortgage lenders after bankruptcy isn’t funny. Preventing lenders from sending mortgage statements to homeowners after bankruptcy just sets families up for foreclosure and rewards servicers with the fees that follow default. It’s just a stupid result that no one has fixed. One law says that the lender’s lien on your home remains enforceable after bankruptcy. The second law prohibits efforts to collect a debt after bankruptcy. The survival of the lien after bankruptcy protects the secured lender; the injunction against post bankruptcy collection protects the debtor. The sixtyish client sitting in my office had assets worth 10 times his credit card debt. What could bankruptcy possibly do for someone who was solvent? His problem was liquidity and an income that was certain to decline in the next few years. His generous disability income would end at 65, leaving him with only Social Security and the income from the illiquid annuities to live on. Minimum payments on $50,000 of credit card debt took 40% of his current income. It would take 42 years to pay it off at contract terms. Like so many clients, he wanted desperately to pay off the debt, yet the credit card interest rates made it impossible without selling off the assets on which he relied for a stable future. Care to guess what saved the day? The Federal Reserve! The interest rate on federal funds was at .18%. Less than one percent. It’s the federal funds rate that defines the interest rate on federal judgments, and therefore the interest a solvent debtor must pay creditors in Chapter 13. 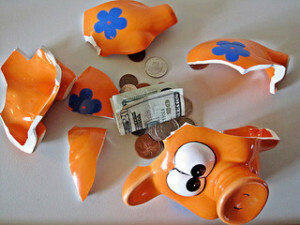 Other professionals should know better than to advise people about the workings of bankruptcy. And if they don’t know better, they should be made to pay, in some exquisitely painful way, for the harm they inflict. The rack seems good to me. The terrified client in my office was told by her accountant that if she filed Chapter 13 to save her home, the court would not allow her to buy prescription dog food for an ailing 16 year old pet! Further, the accountant went on to declare that in Chapter 13, the debtor could pay only for housing, food and gas: nothing more. No maintenance for the house, no insurance, no clothes, no medical care. Actor Fred Thompson used to appear on my Sunday morning news program every week touting the benefits of a “government insured”, safe, reverse mortgage. Get the money you deserve to live the good life, he urged. I’m watching the aftermath of that sales pitch play out for one of my clients, and it’s not “the good life” I’m watching. In fact, the foreclosure sale on the home is scheduled for next week. The borrower, a single woman of many decades, took out the reverse mortgage and drew down on the loan. She has passed away, leaving the house to my client. The house may have as much as $300,000 in equity over and above the reverse mortgage. But because the borrower has passed away, the lender won’t take payments from anyone else. The loan is due and full, says the lien holder, and that’s that. The climate for a refinance of the property in the hands of my client isn’t auspicious, so the house, and all that equity, may go, not to the relative of choice, but to the “friendly”, reverse mortgage lender. A bankruptcy filing may solve this particular problem. We’ll see. Bankruptcy is an option only because the heir to the house is an individual. Individuals can file bankruptcy. Trusts and estates cannot. If the elderly borrower had left the house to her estate, the automatic stay that comes with a bankruptcy filing, would not be available to the probate estate. The probate estate isn’t eligible for bankruptcy relief. The risks of reverse mortgages are becoming more apparent, summarized in this Consumer Financial Protection Bureau report to Congress. A surviving spouse who is not on the loan may have no right to stay in the home on the borrower’s death. The loan is complex and may encourage premature tapping of home equity. In the bigger picture, the pressure to tap home equity to support retirement is the predicable result of regarding your home as your piggybank or your retirement nest egg. The only way to take advantage of that nest egg is to either sell the house or to borrow against it. By retirement age, most homeowners aren’t great candidates for a conventional loan contemplating monthly payments. And as we’ve seen in the Great Recession, you can’t count on a robust real estate market when you need that equity for retirement. So, the gap in the retirement safety net is created, and in steps Fred Thompson and the company he shills for. As the sergeant on Hill Street Blues said every shift: Hey, let’s be careful out there. The latest IRS scam is happening in bankruptcy, out in the open. Now usually when I write about IRS scams, I’m talking about genuine bad guys either pretending to be the IRS to hijack your money or pretending to be you to the IRS, to hijack your money. But nobody is pretending in the trick I first saw last week. The IRS is simply trying to collect the Affordable Care Act penalty twice. My client filed Chapter 13, owing income taxes. The most recent of those taxes must be paid in full to get a Chapter 13 discharge. So, the amount that must be paid is critical to the success of the plan. The IRS filed a proof of claim for the unpaid income taxes. But then, weeks later, the IRS amended their claim to add an “excise tax”, for the penalty under the Affordable Care Act, for not having health insurance. The IRS conveniently “overlooked” the fact that the filed tax return already included the penalty on line 61 of the 1040. So, they wanted to get paid twice by putting a benign label, “excise tax”, on the form, and hoping that you didn’t dig deeper. The tax law for the years in question, 2015 and 2016, imposed a penalty for not having insurance, to be collected by the IRS. The IRS form includes a line where you add the penalty to your taxes if you didn’t have appropriate insurance. So when my client filed his return, he’d already added the penalty to what he owed. And the IRS dutifully used his return to claim payment for the unpaid amount. But it’s not OK to double dip and add a duplicate penalty with another name. When I challenged the IRS agent who filed the claim, his response suggests that he’d not looked at the client’s tax return; he’d just added the penalty to the claim by rote. Conversations with fellow bankruptcy specialist William Brownstein suggests the IRS confusion runs more broadly on this issue. He reports the IRS assessing non-bankrupt tax payers with penalties for not including form 1095-B with their returns, even though the form itself says “don’t file with your return”. So, the first step is to eliminate the duplicate claim. Recent taxes are given a priority for payment under the Bankruptcy Code. If the ACA penalty is a “tax” within the meaning of the Bankruptcy Code, it must be paid in full in Chapter 13. But, is this exaction a tax? A Louisiana bankruptcy court recently said no in a case called Chesteen. It’s not a tax, it’s a penalty. And as a penalty, it isn’t entitled to payment in full, and as a penalty, it is dischargeable at the completion of the plan. Great work by NACBA member Rachel Thyre Anderson, who reports that the decision has been appealed. While the issue of whether the penalty is a tax or not may not yet be settled by the Chesteen decision, it is clear that the IRS, at best, only gets to collect the penalty once. If the penalty is properly included on the tax return as filed, then any additional “excise tax” that claims priority status should be challenged. Do it yourself seems so industrious and self reliant. And we’ve been bombarded with books, speeches and courses on the evils of probate. So, I guess it should be no surprise when people try DIY schemes to both avoid probate and avoid lawyers who create probate-avoiding trusts. Yet they forget an unavoidable truth: the transfer of bank accounts or title to property intended to facilitate the care of the elderly or enable the fee-free passage of property to the next generation can end up involving all parties in a bankruptcy lawsuit. While the goals are admirable and understandable, the consequences can be horrific when a bankruptcy filing comes along. Frank Pipitone tells a gut wrenching story of a DIY bankruptcy involving a DIY will substitute that will likely cost the elder her home. The job of a mortgage servicer is to collect loan payments and keep track of what’s owed on the mortgage. That shouldn’t be too hard. But the evidence is that they don’t do that basic job very well. Throw a loan modification into the mix, and who knows what you’ll get. I got a glimpse of what we face when my client requested a loan payoff in connection with a sale. The loan had been modified some five years ago, with the result that a sizable hunk of the amount due when the loan was modified was due only upon sale. Asked for a payoff, the servicer returned a payoff that failed to include some $127,000 of non interest bearing principal. Granted, this particular mistake cut in favor of my client. Who are we to complain? But it is just as easy to image that the blunder works the other way: the requested payoff doesn’t take into account the changes made to the debt when the loan was modified downward. The payoff demand could just as easily have been calculated at the old, higher rates in effect before modification. Multiply this instance by a fraction of the modified loans out there, and we need to tell Houston we have a problem. Mortgage modifications were supposed to save both individual homeowners and the economy as a whole. They promised to keep homeowners in their homes despite the housing crash of the Great Recession. To some extent that has worked. Or at least mortgage modifications spread the failures out over time so that the market wasn’t glutted with foreclosed properties. But anyone who has attempted a mortgage modification knows first hand the frustration of submitting an application to the servicer. Over and over, the servicer claims that you haven’t sent the documents, or the documents are stale or incomplete. Servicers have no records about the loans they did modify. Or, more precisely, the records they have are not to be trusted. The casualness with which servicers approached modifications has scared me for sometime. The quality of the customer interface at the servicer was laughable, if it wasn’t frightening. The problems are compounded when the servicing on loans changes hands. The new servicer starts with the ending balances from the prior servicer. Few records other than an electronic data base change hands. Any mistakes made by the prior servicer are now impenetrable. The terms, or maybe even the enforceability of the modification itself, are lost in the mists of time. Who knew that homeownership was going to be a contact sport? But you have to assume, if you got a loan modification, it will be up to you to defend the modification when the time comes to pay it off. Keep good records– find and preserve the loan modification agreement. Treat it as being just as important as the deed to your home. Your goal is to have your own records supporting the terms of the loan modification and to catch any problems in accounting early. May all the lender’s mistakes cut in your favor, and may the Force be with you. You’ll need all the help you can get. The elderly couple was suddenly in financial trouble. The two mortgages on their home were a couple of months delinquent. Their bank account had just been levied by the state taxing authority. They hadn’t filed tax returns since 2009. From the outside, it didn’t seem like anything had changed. Yet their financial world was imploding. Turns out, they had entered into a debt repayment plan over the phone. The caller got their attention while they were comfortable at home, over the phone. They signed up, over the phone. They couldn’t tell me even who the caller represented, But, the voice on the other end of the phone promised to keep creditors from calling them anymore. With the clients’ permission, this creditor was automatically taking money out of their account monthly. And when the tax levy hit, there wasn’t enough money to keep a roof over their heads. These elders were victims of their telephone and their good intentions. It’s a nearly universal truth that the only creditors who call you about your debts are the least important creditors among those you owe. Credit card companies can’t force you to pay their debt without suing you, getting a judge to agree you owe the money and giving you a chance to defend. It’s cheaper and more effective to frighten or shame you into paying. And even better if they can get you to give them regular access to your bank account. What could be better? What seemed to have happened here was a debt collector called up and offered a solution, one that would stop harassing phone calls and pay the credit card debt automatically. But, the “solution” would only pay the credit card debt. That is, the only debt that would be paid is the debt that could be discharged in bankruptcy. The mortgage debt that kept a roof over their head became second to the debt management program. No attention was paid to the back income taxes. It was exactly the wrong order of payment. The least had become the first among creditors. The tactics of debt collectors aren’t confined to the elderly, but they sure work better if the person who owes the money is frail, alone, or unsophisticated. That described the couple in my office. The good news for my couple was that their children had somehow gotten wind of the trouble and came with their parents to see if bankruptcy could help. And bankruptcy will help. In the bigger picture, adult children need to be sensitive to how well elderly parents are managing their money. Is there credit card debt that is eating into the budget? Who is automatically debiting the elders’ bank account? If they still drive, is their auto insurance sufficient to protect their home? The telephone is the instrument by which legitimate but self interested creditors can get to the elderly and convince them to warp their financial priorities. Whether the pitch uses annoyance, fear or shame, the result is the same: the elder pays the wrong creditor. If these could be your parents, screw up your courage and find out what is happening, on the phone and at the bank. It can be a difficult conversation for elders clinging to independence. But you have to have that conversation if you’re to help them, before their roof falls in. Image courtesy of notKlaatu and openclipart.